Price listed is for eight stone settings. These are approximately 36ss (about 7.4mm to 7.7mm) silver plated settings. They have a hole in the bottom for point back stones. These are unusual stone settings with channels running across the bottom/sides. 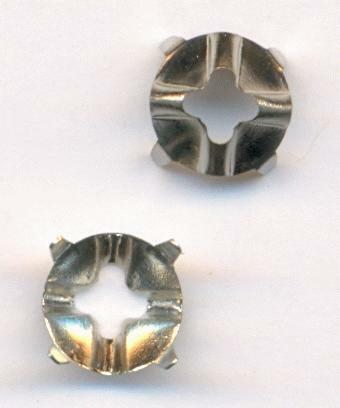 It looks like you might be able to use them as sew ons after the stone has been set or possibly sew them on and then place a stone in the setting and close the prongs down.